From Kleenex to paper towels to diapers, it's a safe bet you use Kimberly Clark products for your home and business on a daily basis. Kimberly Clark is one of the world's leading manufacturers of personal paper products. Kimberly-Clark and its well-known global brands are an indispensable part of life for people in more than 150 countries. Every day, 1.3 billion people--nearly a quarter of the World's population--trust Kimberly Clark products and the solutions they provide to enhance their health, hygiene and well being. Kimberly Clark operates under four business areas: personal care, consumer tissue, Kimberly Clark Professional, and health care. Kimberly Clark paper towels, Kleenex facial tissue, Cottonelle and Scott brand bathroom tissue are just several of the many Kimberly Clark products that are well known throughout the World. With other brands such as Huggies, GoodNites, Little Swimmers, Pull-Ups, Kotex, Depend, Poise and Viva chances are you already use many Kimberly Clark products. The professional segment of Kimberly Clark products offered, boasts popular brands such as Scott, Kleenex, WYPALL, KIMTECH, KLEENGUARD and KIMCARE. At ReStockIt.com, we sell Kimberly-Clark products in bulk and individually at the lowest prices - guaranteed! Find Kimberly Clark coupons at ReStockIt.com and save big on Kimberly Clark paper towels, Kleenex facial tissue and other Kimberly Clark products at the lowest prices every day guaranteed! 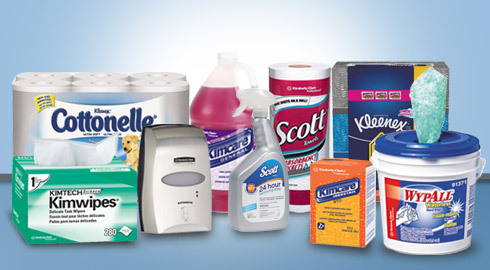 Why pay more for the same home and business essentials you need, when you can save with Kimberly Clark coupons at ReStockIt.com today? Shop Kimberly Clark paper towels -from household paper towels to multifold paper towels, ReStockIt.com has the best selection of Kimberly Clark products to choose from.